All transactions are safe and secure with a reliable history in online purchasing behind each of our associates. Buy the Army Green G.I. 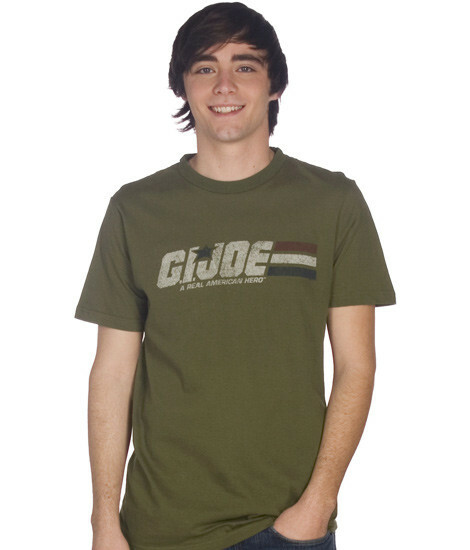 Joe Logo shirt to own G.I. Joe clothing and merchandise. Fight for freedom wherever there's trouble in this classic piece of G.I. Joe clothing. The authentic military style green tee features a distressed G.I. Joe logo on the front that sits above the G.I. Joe cartoon tagline, "A Real American Hero". Honor Duke, Mutt, Snake Eyes, Roadblock, Breaker, Tunnel Rat and the rest of the special mission force who defend human freedom against Cobra the enemy. This tee is the perfect gift for every G.I. Joe fan, or any fan of 80s nostalgia. With this retro t-shirt on your back, you'll be saying, "Yo Joe!" in no time. In addition to the Army Green G.I. Joe Logo tee above, browse the G.I. Joe Clothing Gallery for more apparel like men's and women's clothes, kids shirts or hoodies.